The Hove town Hall was originally Brunswick Town Hall, built as the headquarters of the Brunswick Commissioners. It housed the police station and fire service. The growing population needed a larger building and Alfred Waterhouse, Who designed the Natural History Museum, was commissioned to build one. 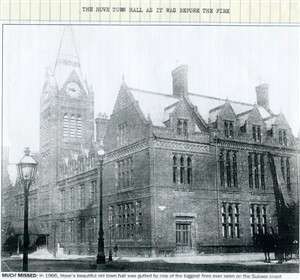 The new Town Hall was completed in 1882. A major feature was the clock tower and its set of enormous bells with a repertoire of 14 Patriotic songs, which automatically played at midday. This huge imposing red brick building in Church Road, occupied the land between the southern end of Tisbury Road and Norton Road. It was the symbol of Hove, and the great hall, with its organ, was the focus of community life in the days when there was no in-house entertainment. All this ended in the early hours of Sunday, 9th January 1966. 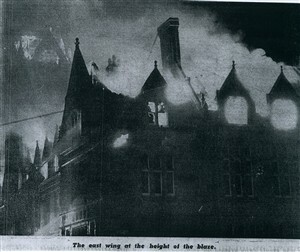 This account of Hove Town Hall fire was told to me by my very dear friend, Katie Ashdown. 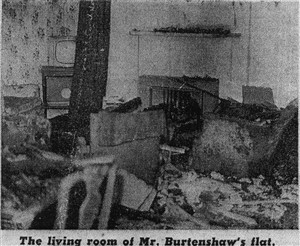 She and her husband, Ranny, went to stay there in the top floor flat for just one night with their friends, the Town Hall Superintendent and his wife, Iris and Stan Burtenshaw and their teenage son and daughter. Kate and her husband were both trained Civil Defence Lecturers and had been through the London Blitz in the Second World War. It was doubtless their training and experience of fire fighting that prevented any fatalities on that dreadful night of destruction. I first met Katie Ashdown in the late 1950’s when she was a member of the Civil Defence Department in Princes Street, Brighton. It was a well known fact to both our staff and the Fire Service that her great ambition was to go up the one and only turntable ladder. One evening, as part of one of her lectures, she took her class to the Preston Circus Fire Station. She was the first one to climb up the Practice Tower but as she reached the first landing she absolutely froze. Early in the sixties Katie Ashdown was forced to retire due to severe arthritis in her right hip, there were no hip replacements in those days. After she had a heart attack scare she and her husband moved to Calne in Wiltshire which was more convenient for her job of lecturing to the Army on Civil Defence and Fire Fighting. After many requests to come and stay with their friends at the Hove Town Hall, they finally decided on just one night because of the severe pain Katie was suffering with her hip. She was a very attractive woman, always very smartly dressed, but at the last minute she decided to wear slacks - a decision she was to be very thankful for as things turned out. As they were leaving home Katie reminded Ranny to take his camera and a mysterious photograph they had taken while on holiday in Southern Ireland. She knew Stan, who was a keen photographer, would be interested. The mysterious snapshot had been taken in a very remote part of Ireland. They were driving up a picturesque cobble-stoned lane with a pretty church on top. There was an old man pushing a bicycle up the hill and just in front of him was a small chubby-faced little boy in a red jacket, carrying a small old-fashioned cream churn. The scene was so exceptional that they stopped at the top to take a photograph and Katie’s smiling greeting to the little boy was rewarded with a cheeky grin as he came within the framework of the picture. However when the photograph was developed, their disappointment was immense - for there was the church and the old man pushing his bicycle but there was no sign whatsoever of the little boy. The photo was sent to Kodak for investigation but the answer was that it was a perfect photograph with no disturbance of the cobble stones where the little boy should have been standing. This was never done and on the 8th January 1966 that photograph and the camera that took it, went with them to the Hove Town Hall. For that one night visit Stan and Iris had given up their bedroom for Katie and Ranny. Iris went to sleep with her teenage daughter and Stan slept in a small back room with blacked out windows that he used as a dark room. Thus it was that he never saw any sign of the fire that started in the Great Hall at the back of the building where there had been a function held the previous evening. Such an enormous fire disaster meant that fire services were called from all surrounding areas. The one and only big turntable ladder was immediately employed at the seat of the fire on the northeast corner of Tisbury Road. At first it didn’t seem to be known that anyone was resident on the top floor of the Town Hall, thus there was a delay in their rescue. The first Katie knew of the disaster was being gently awakened by Iris telling her that the building was on fire. As she and Ranny scrambled into their clothes, they could hear Iris calling out frantically to Stan. Apparently he had opened a trap door and climbed down a ladder to the Magistrates Court below, but the ladder had a six foot gap at the bottom so he could not get up again. Ranny told him to go to the window and flash his torch. He said it was essential that the trap door be shut as it was endangering all their lives. They assembled at the heavy oak front door but when Ranny opened it the intense heat was just like a blast from a furnace. The bathroom window was stuck up with paint, so Iris took him into the kitchen. The first thing that Katie saw was the huge old fashioned sink in front of the window and she knew her arthritic hip would never permit her to get over that. Ranny found an enamel mug under the sink and threw it out of the window, knowing that if a fireman saw something thrown from above their presence would become known and it was with great relief that he heard the curses of the fireman who was the recipient of his missile. As the only turntable ladder was already being used to fight the fire at it’s source, there was only an ordinary 50 foot extension ladder available and this had to be manhandled from the back of a fire appliance into the right position. Soon two cheerful firemen appeared at the window and stepped inside. Thus the rescue began. True to the well known saying “Women and children first” Iris and her daughter were first to be rescued. Then it was Katie’s turn. They overcame the problem of the oversized sink by one fireman going outside on the top of the ladder, the other fireman remaining inside to hold her head and Ranny supporting her middle they passed her out like a precious cream cake over the sink and out of the window. But when she got on top of the ladder she found, to her horror, that she had insufficient movement in her hip to enable her to reach the next rung. Thus she reached the ground from the top floor of that huge building, which was no small achievement for a woman suffering from heart trouble and severe arthritis who certainly had no head for heights. While Katie was being told not to look down the firemen fighting the fire were being told not to look up because of the amount of hot lead falling from the roof above. Stan had also been rescued by the time the others were saved and when they all assembled in the back of the ambulance they discovered they all looked like the Kentucky Minstrels with black faces. One thing those two cheerful firemen would have been well aware of, as they stood laughing and joking in the kitchen, was the risk of the collapse of the clock tower with its enormous bells, right where they were organising the rescue. This, in fact, happened immediately after they all got out. When daylight came and the fire was under control Ranny was taken up on the turntable ladder and through the window of the bedroom in which they had slept, to see if any of their belongings could be salvaged. Everything was burnt to a cinder. There was certainly no sign of the mysterious photograph or the camera that had taken it. A final coincidence to this story was that some year later Katie and Ranny decided to move to Ireland permanently. While sitting on the quayside waiting for the ferry, a man came and sat next to them - it was one of the two firemen who had rescued them on that terrible night.